The renal tubule is responsible for the reabsorption of more than 99% of the water and sodium in the glomerular ultrafiltrate. Congenital or acquired tubular dysfunction can therefore readily cause profound electrolyte and volume disturbance. The tubule also has to regulate acid–base balance, mineral homoeostasis, and the excretion of organic anions and drugs. To fulfil these functions, a large number of specialised transporters and channels are specifically localised in the tubular cell membranes, some in the luminal border and others in the plasma membrane border (basolateral membrane). In the past decade (and especially in the past five years) advances in molecular genetic research have revealed the structure, function, and effects of mutations in these transporters, thereby greatly increasing our understanding of the function and dysfunction of the renal tubule. Some renal stone disorders (for example, cystinuria, Dent's disease) and rare genetic causes of hypertension (for example, Liddle's syndrome) are now known to be caused by mutations in tubular transport systems. Many children with genetic defects in tubular function present in infancy although there are several, less severe disorders that present later or may be asymptomatic (for example, Gitelman's syndrome) and may only be detected when the patient has a blood or urine sample taken as part of a routine assessment. As a result the true incidence of some of these defects is not known. Many tubulopathies lead to failure to thrive; those causing chronic dehydration, salt wasting, or acidosis will inevitably impair growth, while excessive phosphate wastage will lead to rickets and retard bone development. Children with renal stones or who are found to have nephrocalcinosis require investigation of their tubular function. The initial assessment of tubular function is based on the results of routine biochemical investigations. The request for plasma biochemistry should include sodium, potassium, urea, creatinine, bicarbonate, chloride, calcium, phosphate, and magnesium, and a urine sample should be collected for determination of urine electrolytes (sodium, potassium, chloride, calcium, phosphate), amino acids, glucose, and creatinine. Documentation of urine pH (by glass electrode) during an episode of severe acidosis (either spontaneous or induced by ammonium chloride) helps to differentiate between proximal and distal renal tubular acidosis (RTA). In proximal (type II) RTA, at a time of severe acidosis, the urine pH will fall to less than 5.5, while in distal (type I) RTA, the urine pH will remain above 6. The osmolality of a sample of the first morning urine is a useful check of renal concentrating ability (normally more than 800 mOsm/kg, but less in infants). Determination of urinary low molecular weight proteins (for example, retinol binding protein, β2 microglobulin) and enzymes (for example, N-acetyl glucosaminidase) provides more sensitive and specific evidence of proximal tubular dysfunction and/or damage. An abdominal ultrasound to check the renal anatomy and to look for the presence of nephrocalcinosis, together with a radiograph of the wrists or knees for evidence of rickets, completes the basic assessment. The proximal renal tubule is the site of the bulk of solute and water reabsorption in the nephron. Approximately 60% of the filtered sodium is reabsorbed in the proximal segments, along with water, potassium, bicarbonate, phosphate, amino acids, and low molecular weight proteins. Dysfunction of the proximal tubule may be isolated or generalised. In contrast, the distal tubule has a specialised role in the final modification of urine. Specialised transporters are involved in the regulation of sodium and potassium reabsorption and in proton secretion. Disorders of the distal tubule therefore tend to be isolated to a specific transporter. Proximal RTA in children is usually seen as a part of the renal Fanconi syndrome, consisting of aminoaciduria, glycosuria, bicarbonaturia, phosphaturia, and rickets. Most paediatric cases occur as part of a metabolic disorder although it may be found in some nephropathies and following exposure to some drugs and toxins (see table 1). A Fanconi like syndrome can be seen in severe vitamin D deficiency; similar plasma biochemical abnormalities can also be seen in patients with chronic diarrhoea. Recent evidence supports the theory that there is a common pathogenetic mechanism for the Fanconi syndrome. Rather than there being a multiplicity of defective transporters accounting for the many solutes lost in excess, it is far more likely that the various metabolic disorders all, in some way, reduce the availability of ATP for the enzyme NaK-ATPase, thereby reducing sodium extrusion from the tubular cell and reducing the gradient for solute transport which is coupled to sodium reabsorption.1 Such generalised dysfunction often causes severe sodium and water losses in addition to the other electrolytes (potassium, bicarbonate, phosphate, etc). X linked hypophosphataemic rickets (XLHR, also known as vitamin D resistant rickets) is the commonest inherited form of rickets. Children present with short stature and rickets and investigations show a normal plasma calcium, phosphaturia, hypophosphataemia, a normal parathyroid hormone level, and an increased alkaline phosphatase concentration. The pathogenesis is complex with evidence of abnormal sodium coupled phosphate cotransport, abnormal vitamin D metabolism, abnormalities of intracellular bone metabolism, and the presence of an as yet unidentified phosphate regulating hormone “phosphatonin”).5 Patients have mutations in the PHEX gene which codes for a membrane glycoprotein that has endopeptidase activity (endopeptidases have an important regulatory effect on some hormones6). There are rarer disorders with hypophosphataemic rickets, inherited in an autosomal pattern (for example, the autosomal recessive form associated with hypercalciuria). Since their description some 30 years ago, there has been much debate about the pathogenesis of Bartter's syndrome and its variants.7 The presentation varies from polyhydramnios, prematurity, and life threatening neonatal electrolyte disturbance, through failure to thrive to asymptomatic detection of abnormal biochemistry in later life. These disorders share features of hypokalaemic alkalosis in the presence of a normal blood pressure, elevation of plasma renin and aldosterone, and increased urinary chloride and potassium loss. Some have hypercalciuria and nephrocalcinosis, some have hypomagnesaemia and hypocalciuria. Recent work has greatly illuminated our understanding of these disorders and thereby of electrolyte transport in the loop of Henle (see fig 1). Sodium chloride is absorbed in the thick ascending limb by a sodium–potassium-2 chloride cotransporter (NKCC2), the target for inhibition by loop diuretics (for example, frusemide). 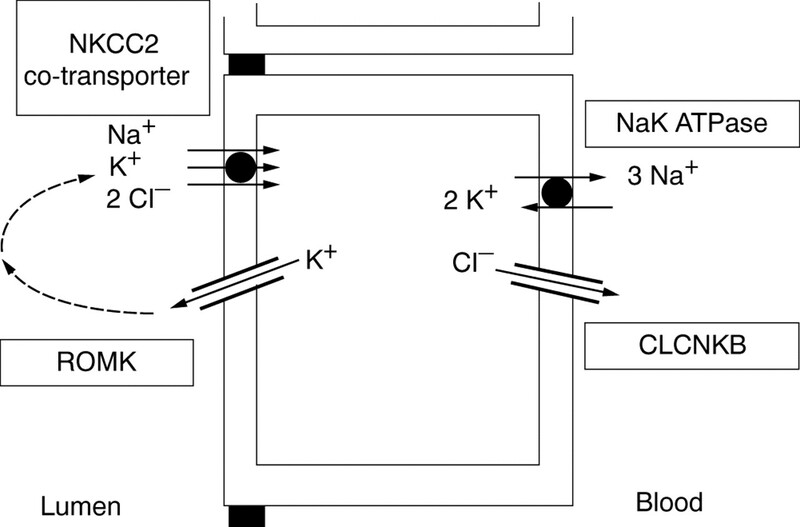 Reabsorption of sodium and chloride by NKCC2 depends in turn on basolateral NaK-ATPase (to generate a gradient for sodium entry into the cell), recycling of potassium out of the tubular cell into the lumen (using a potassium channel, ROMK), and transport of chloride across the basolateral membrane (by another chloride channel, ClC-Kb). Mutations in the genes coding for NKCC2, ROMK, and ClC-Kb have been identified in patients with various Bartter syndromes and there is some correlation between the genotype and phenotype.8-10 In general, children with the more severe phenotype (neonatal Bartter syndrome) tend to have mutations in the genes coding for NKCC2 or ROMK while those with the milder “classic” Bartter's syndrome have mutations affecting the chloride channel ClC-Kb. Individuals with Gitelman's syndrome are often asymptomatic but are characterised biochemically by hypokalaemic alkalosis, hypomagnesaemia, and hypocalciuria. The molecular defect affects another sodium chloride cotransporter (NCCT) but with differences to NKCC2. NCCT is localised in the distal tubule, does not transport potassium, and is the target for thiazide diuretics.11 The mechanism of hypomagnesaemia is not proven. Schematic view of a renal tubular cell in the thick ascending limb of the loop of Henle. Pseudohypoaldosteronism type 1 (PHA1) is a recessive disorder of severe urinary salt wasting, presenting in the neonatal period with weight loss, vomiting, dehydration, and sometimes respiratory distress. It is characterised, biochemically, by hyponatraemia, severe hyperkalaemia, and raised plasma renin and aldosterone concentrations. Recent work has shown that PHA1 results from mutations in the three subunits of the amiloride sensitive epithelial sodium channel.14 Other mutations in subunits of the same sodium channel lead to a rare autosomal dominant form of hypertension (Liddle's syndrome).15 Thus some mutations cause gain of function, increased sodium–potassium exchange in the distal tubule, and hypertension (Liddle's) whereas loss of function mutations are associated with salt loss (PHA1). The recent explosion in studies defining the molecular basis of disease has greatly increased our knowledge of the renal tubule and has defined the pathogenesis of many tubulopathies. There is still much to be done and atypical cases (for example, Bartter's syndrome variants) will continue to pose challenges. These genetic studies now need to be followed by a return to biochemical research to link the mutation to the phenotype. This is especially relevant in proximal tubular disorders where an insight to intracellular dysfunction in single gene disorders is likely to reveal the mechanisms of the commoner acquired tubular dysfunction (for example, in acute tubular necrosis). In addition, funding for research initiatives has not yet been paralleled by provision of routine molecular genetic diagnostic services. The diagnosis of a renal tubulopathy therefore continues to rely on a high index of suspicion and the correct interpretation of plasma and urine biochemical data. (1999) Cystinosis and Fanconi syndromes. in Pediatric nephrology, eds Barratt TM, Avner ED, Harmon WE (Lippincott, Williams and Wilkins, Philadelphia), 4th edition. pp 593–607. (1998) A novel gene encoding an integral membrane protein is mutated in patients with nephropathic cystinosis. Nat Genet 18:319–324. (1999) Intra-renal and subcellular distribution of the human chloride channel, ClC-5, reveals a pathophysiological basis for Dent's syndrome. Hum Mol Genet 8:247–257. (1994) Molecular biology of hypophosphataemic rickets and osteogenic osteomalacia. Hum Genet 94:457–467. (1995) A gene (PEX) with homologies to endopeptidases is mutated in patients with X-linked hypophosphataemic rickets. Nat Genet 11:130–136. (1998) Bartter and related syndromes: the puzzle is almost solved. Pediatr Nephrol 12:315–327. (1996) Genetic heterogeneity of Bartter's syndrome revealed by mutations in the K+ channel, ROMK. Nat Genet 14:152–156. (1997) Mutations in the chloride channel ClC-Kb cause Bartter's syndrome type III. Nat Genet 17:171–178. (1996) Gitelman's variant of Bartter's syndrome, inherited hypokalaemic alkalosis, is caused by mutations in the thiazide-sensitive NaCl cotransporter. Nat Genet 12:24–30. (1997) Familial distal renal tubular acidosis is associated with mutations in the red cell anion exchanger (Band 3, AE1) gene. J Clin Invest 100:1693–1707. (1999) Mutations in the gene encoding B1 subunit of H+-ATPase cause renal tubular acidosis with sensorineural deafness. Nat Genet 21:84–90. (1996) Mutations in subunits of the epithelial sodium channel cause salt wasting with hyperkalaemic acidosis, pseudohypoaldosteronism type 1. Nat Genet 12:248–253. (1994) Liddle's syndrome: hereditable human hypertension caused by mutations in the β subunit of the epithelial sodium channel. Cell 79:407–414. (1992) Mutations in the vasopressin type 2 receptor gene (AVPR2) associated with nephrogenic diabetes insipidus. Nat Genet 2:99–102. (1992) Mutations in the V2 vasopressin receptor gene are associated with X-linked nephrogenic diabetes insipidus. Nat Genet 2:103–106. (1994) Patients with autosomal nephrogenic diabetes insipidus homozygous for mutations in the aquaporin-2 water-channel gene. Am J Hum Genet 55:648–652.